Malvinas Argentinas is a district made up of the following areas: Los Polvorines, Ingeniero Pablo Nogues, Tortuguitas, Grand Bourg y Campo de Mayo. Malvinas Argentinas is located in Northern Greater Buenos Aires, 35 km away from the City of Buenos Aires. The area of Malvinas Argentinas was created on October 20 1994 on lands that were until then part of the a district that used to be known as General Sarmiento, and a smaller portion of land from the neighboring district of Pilar. Malvinas Argentinas has a total surface area of 63.8 km2. The districts main city is called "Los Polvorines" and it was build along the railroad of General Manuel Belgrano together with a smaller city called "Del Viso." When the funds from the two trainstations were united, the lands that today form the district were purchased. This area is very well placed in reference to to highways connecting all the areas of Buenos Aires. It is surrounded by highways leading to Pilar and Escobar and by the "Panamericana" Highway that is used daily for transportiing products internatinally to other countries that are part of the Mercosur. Being in such a tight spot between different highways has made Malvinas Argentinas a district with good economical potential. 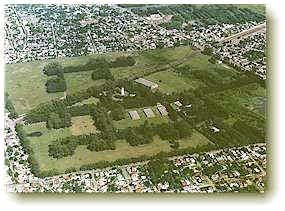 Malvinas Argentinas is located 42 km from The City of Buenos Aires.